French Grey Salts are natural salts gathered from salt ponds in the Atlantic Ocean surrounding the coast of France. Two of the most common salts are Fleur de Sel and Sel Gris, also known as French Salt. Fleur de Sel is harvested from the surface of the pond. 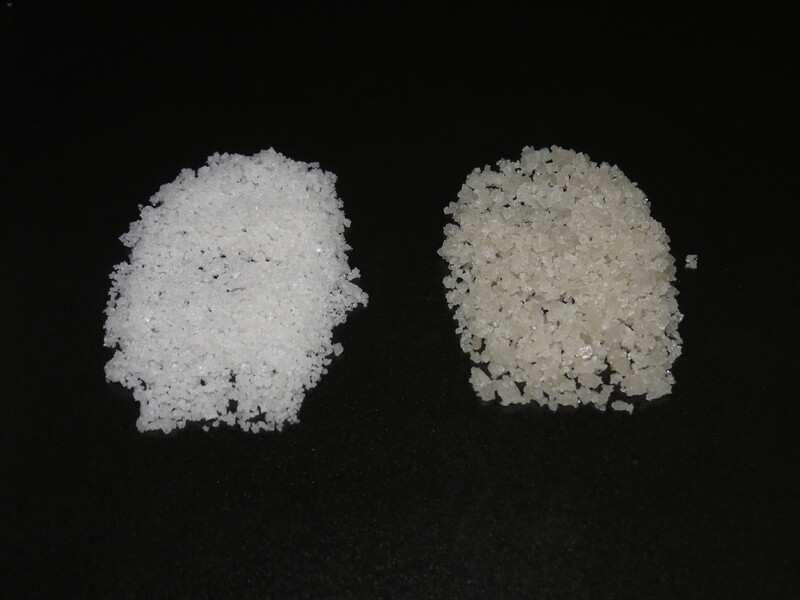 It is a high quality and delicate salt that has a white color. It has an earthy flavor that might also be a little sweet. This salt is used to salt meats, vegetable, fish, and many other dishes. Sel Gris, or French Salt, is gray in color. It is harvested from below the surface after it has passed through clay basins. It is also used to salt various dishes. Both salts have a much higher mineral content than regular table salt. There are many benefits, beyond flavor, to be had when using French Sea Salt. Thanks to the high mineral content there are many health benefits. No chemicals or preservatives are added which also adds to the health perks of using French Sea Salt. One concern when using salt is the high sodium content. However, Fleur De Sel or Sel Gris has a high magnesium content which allows unused sodium to be eliminated through the kidneys fairly rapidly. They minimize water retention while provoking saliva production. Mucus elimination occurs which helps in the release of toxins from the body. It is important to drink lots of fluids while using them as this will aid in the toxin release process. These salts act as a natural antihistamine and can help relieve allergies. They are also a natural soporific and help a person to fall asleep naturally. Just drink warm water with a pinch of sea salt before bedtime every night and watch the sleep benefits occur. Sea salts can also be used as a beauty aid. They are mainly used as an exfoliant or scrub but the high mineral content also allows them to be added to certain cosmetics. Fleur De Sel or Sel Gris mixed with water can be sprayed on hair to give a nicely textured look. Next Next post: Dave’s Killer Bread OR Ezekiel Bread, Which Is Better for You?